Foreign policy, military funding and plans for U.S. troops abroad are providing plenty of chewy campaign fodder for PresidentBarack Obamaand his GOP rival,Mitt Romney. But fundraising reports shed light on what the armed forces think about the the candidates. Former Republican presidential hopefulRon Paulreceived significant support from the military for his strong stance on bringing troops home, and that briefly continued even after Romney pulled ahead as the clear GOP candidate. Now, though, the military&apos;s support has shifted toward Obama. Romney has consistently received little financial backing from military donors. Despite the fact that Paul once raised almost twice as much as Obama did from the military, the president has received $536,414 from military donors, compared to Paul&apos;s $399,274 and Romney&apos;s $287,435, according to research by the Center for Responsive Politics. These numbers are based on donations greater than $200, as reported to theFederal Election Commission. Contributing $176,121, the Department of Defense is Obama&apos;s biggest supporter, with theArmynot far behind with $165,646. TheNavysits in third at $86,656. In comparison, Romney&apos;s top military contributor is the Army with $87,218, followed by the Department of Defense with $71,043 in contributions. However, although Obama&apos;s fundraising totals are higher than his opponent&apos;s, eight of the 11 military branches the Center for Responsive Politics analyzed have given more to Republican presidential candidates -- most notably the Navy, the Air Force and theMarine Corps. The Obama advantage comes even though he said $500 billion in military spending would be cut as part of the sequestration process to help balance the budget, while Romney has alluded to a multi-trillion-dollar increase over the next decade. Despite the president&apos;s $100,000-plus lead over Romney and Paul in funding from the armed forces, the numbers didn&apos;t turn in his favor untilMarchwhen Obama began receiving donations doubling Paul&apos;s.
On a month-by-month basis, the latest fundraising numbers are from August, which show Obama with a $140,761 to $90,273 lead over Romney. Both candidates received most of their August funding from the Army, with Obama pulling in about $21,000 more. Although Vice President Joe Biden and Rep. Paul Ryan (R-Wis.) discussed national security and military funding during their debate last week, voters still are waiting for a more in-depth treatment of the issues from the presidential candidates. That may occur at tomorrow&apos;s second presidential debate at Hofstra University in New York. Correction: This story was changed to accurately reflect that eight of the 11 military branches analyzed have given more to Republican presidential candidates, not Romney alone. 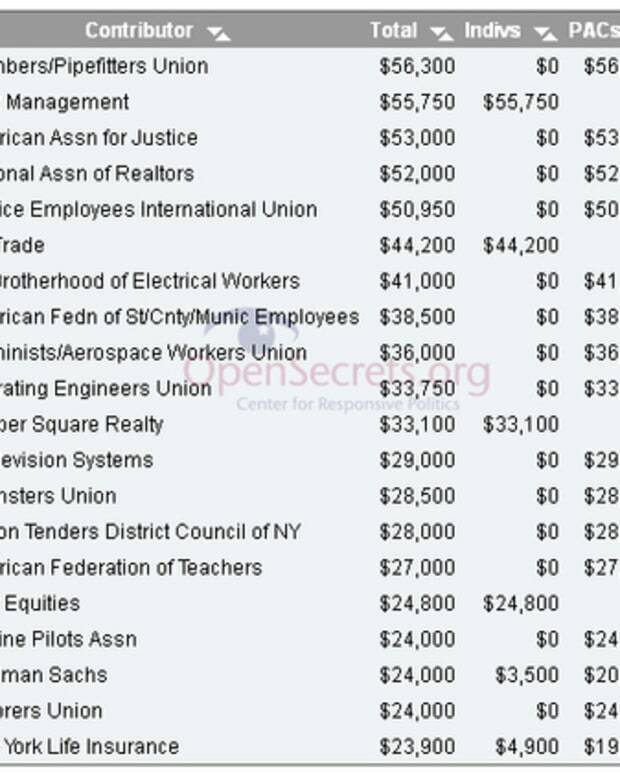 Additionally, the sentence detailing which branches give the most money to Romney has been updated with correct numbers. Will Donors Back Anthony Weiner's Run for NYC Mayor? Mitt Romney "Shamelessly Shilling for His Donors"